quality：This dry Riesling is a fresh, lively wine for everyday drinking. The nose displays aromas of green apple and apricots with underlying flowery nuances all rounded out by a well-balanced acidity. quality：The 2012 vintage shows an exotic nose reminiscent of pineapple and mango with hints of nuts in the background. It's perfectly suited to accompany lighter summer fare. 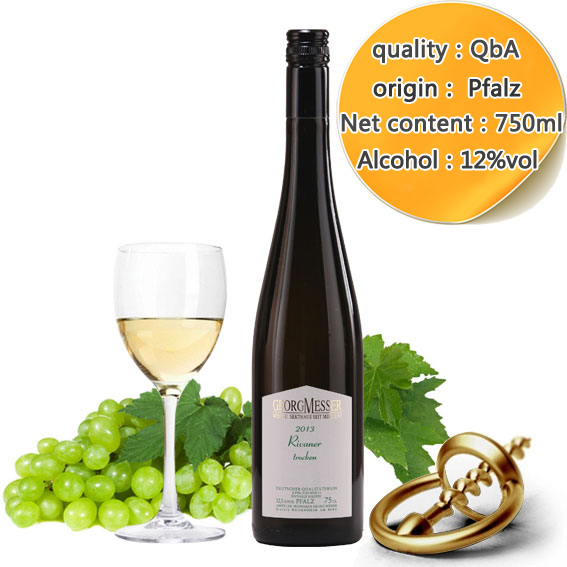 quality：This very fruity and elegant semi-dry (feinherb) Riesling is one of our best sellers. Due to its fine aroma and low acid it fits perfectly to chinese food. quality：This delicious white wine are Pinot Noir or "Spätburgunder" red wine grapes. It's the ideal companion to fish, seafood, white meats and salad. The nose is reminiscent of red berries such as raspberries and strawberries. quality：Complex, powerfull Burgundy with fine aromes of pear and nut, to combinate with meat and fish dishes. quality：This wine is intensive fruity and sweet, perfume of roses. A good companion for cheese and dessert. quality：The 2013 Deidesheimer Herrgottsacker can be characterized as a very full bodied, racy, rich on minerals and appetizing Riesling. quality：This Kabinett is intensive fruity, displaying apricot, pineapple, peach aromas and flavors. It is high in mineral extract, with great density and richness. quality：The 2007 vintage has been named the vintage of the century from a quantity as well as quality perspective.The richness of minerals keeps this Auslese very fresh, but the wine also impresses with its aromas of honey and dried fruit. quality：Produced of very ripe grapes, aromes of peach and raisin , to combinate with fruity desserts and spicy cheese. quality：Grapes concentrated like raisins, juice like syrup, very intensive sweetness but also with an high acidity that gives the wine an interesting fruit- acidiy- sweetness harmony. quality：The Dornfelder grape is the most widely planted red grape variety in the Pfalz region. The wines are known for their combination of full-body and ripe berry fruit, in particular cherry and dark berries. It's very well suited to game birds and red meats. quality：This spritzy Secco is the perfect companion for a hot summer day, but is also very suitable to lighter fares such as seafood and fish. The wine is elegant with a touch of residual sweetness with aromas of passion fruit and citrus. It's easy drinking and will leave you wanting more! 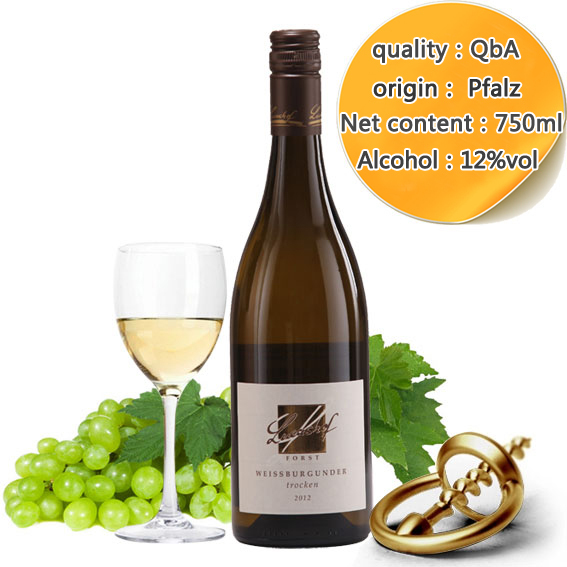 quality： Rivaner is a white grape variety that was bred from Riesling . Rivaner is mild due to its low acidity, but still fruity.The 2013 Rivaner is a dry -developed quality wine that is fresh, fruity, light and with low acidity that was bred from Riesling and Sylvaner. quality：2013 Sauvignon Blanc is a genuine quality with flavours of citrus, green pepper and lichees. Enjoy this full-bodied wine with fish and white meat. quality：Our 2012 Scheurebe,semi-sweet, is a late harvest genuine quality wine with specific attributes. 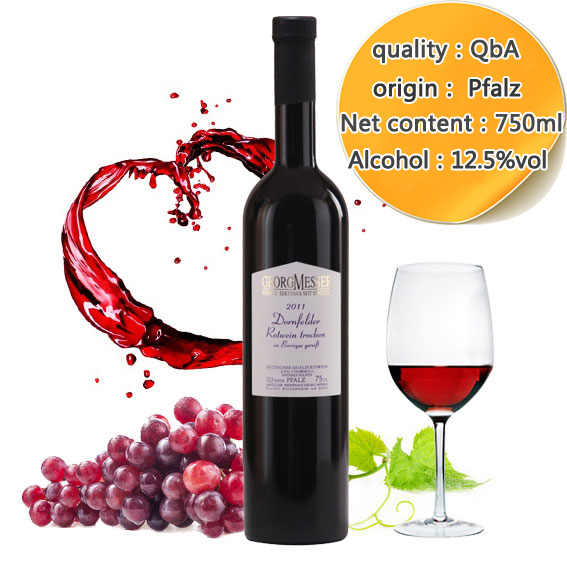 It is a fruity and smart wine, which fits best to enthusiasts of sweet wine. quality：This quality wine is a dry one of classic German style. As a blend from the grape varieties Pinot Noir and Merlot, it connects that way the fruity shares of Pinot Noir with plum and herbal notes of Merlot. This is a great wine for every day. quality：The Dornfelder is an early maturing red wine grape. The wine from Dornfelder grapes has a black-red colour and fruity taste. It's a dry quality wine, with a bouquet of cherries and blueberries and a spicy and velvety taste. quality：This Spätburgunder was matured in a big wood barrel. It is concentrated, full-bodied and with harmoniously integrated tannins. Be fascinated by the personality of this red wine characterized by his flavour of ripe cherries and spicery. quality：This Lucas Hoff Pink trocken was By Pinot Noir and card 100 faction of the grapes and the color is pink, especially strawberries, guava and watermelon scent.